Gather the ingredients for making southwestern coleslaw. Slice the cabbage thin to shred. When the entire cabbage is shredded, put it in a mixing bowl. Slice the bell pepper into strips and then in half. Add to mixing bowl. Slice the carrot into strips, and then in half. Add to mixing bowl. Slice the onion into strips, and then in half. Add to mixing bowl. Add southwestern ranch dressing to the slaw. With food safe gloves, mix the slaw with your hands. Serve with your favorite southwestern meal. 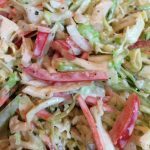 The reason this coleslaw is so low in calories is because the homemade southwestern ranch dressing is made with greek yogurt as apposed to being made with sour cream.